We have also never had the many conveniences many of our friends who live further out in the suburbs enjoy- for example a garage, a master bathroom, a linen closet. However, despite challenges my husband decided to stay first. I am not sure exactly why. He liked the house (as do I). He hates moving. He likes to be financially safe. Any and all of these things probably contributed. One thing is for sure about the choice we made as a family. 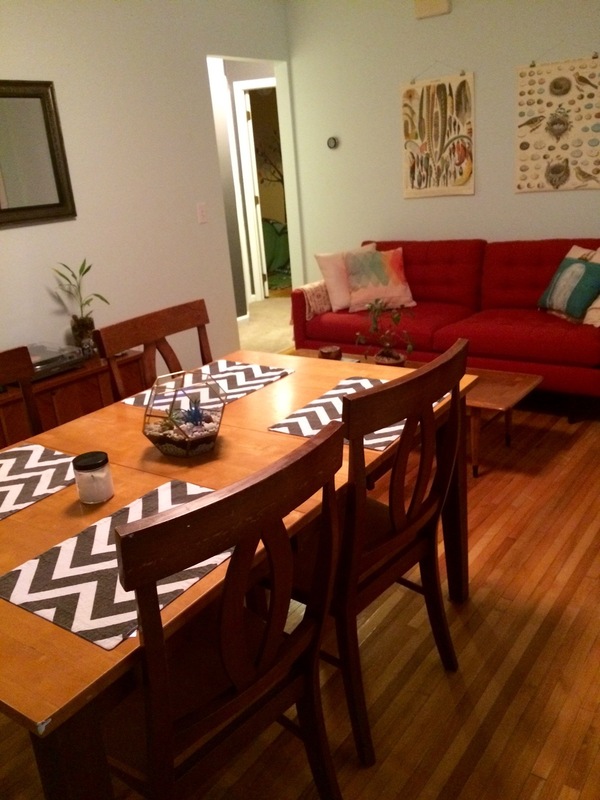 The decision to stay inclined us both toward simplification of our stuff and our spaces. When living small, you either make choices or you swim in stuff (especially if you have kids). And in these words, Thoreau establishes his place as a founder of the minimalist movement. It was by happenstance that I have lived smaller (and I mean this relatively and only in comparison to others in this country who happen to be our peers). This happenstance was furthered by Jamey’s interest in efficiency, which he studies with a passion akin to my fervor for beautiful prose. Using this methodology, we were shortly thereafter decluttering every room in our house. In this first foray into minimalist living, I found the aesthetic pleasure of opening a cabinet and seeing only what is needed in perfect alignment quite satisfying. It was no chore to tear through our belongings getting rid of things. 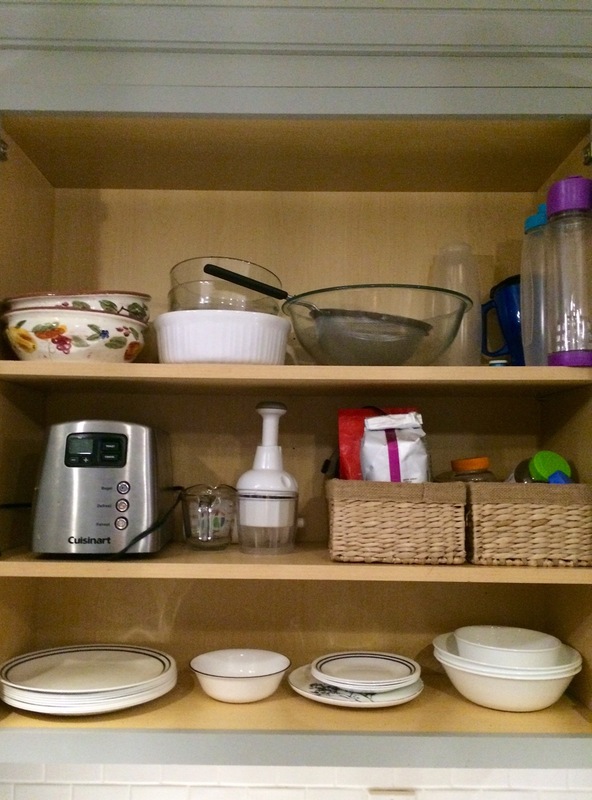 In the middle right shelf, are examples of Jay’s “modulars,” or groups of contained objects with a common purpose, For example, in one mod we keep all of our coffee items: coffee beans, grinder, brush for cleaning the grinder etc. 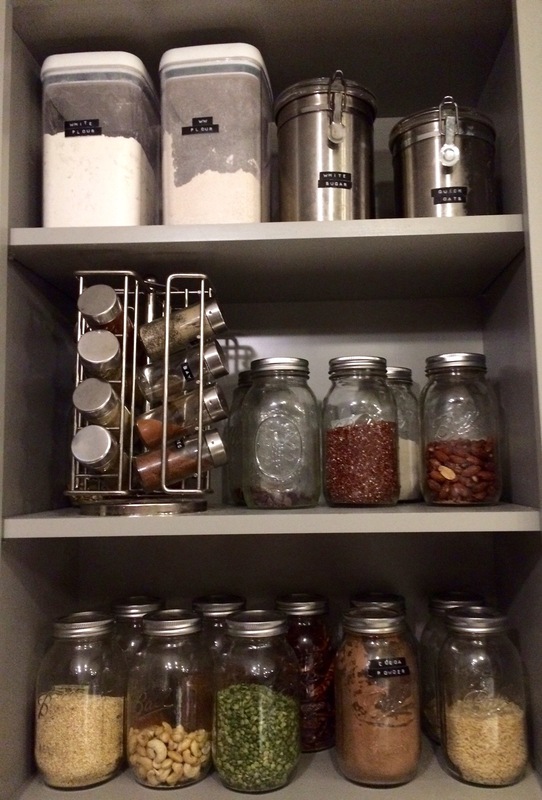 While in our first reorg of the kitchen, I moved all of our cooking items to reusable jars and containers. While this is not from a minimalist book (and more likely from a Martha Stewart blog), I have found it eliminates boxes and bags of stuff that are difficult to store and look through. When I buy almonds before the ones I currently have are all gone, I can just pour them directly into the same jar. And they are pretty. We store these on an open shelf in our kitchen. Jay’s methodology is different, and in some ways quite contradictory, to the more popular book by Marie Kondo The Life Changing Magic of Tidying Up: The Japanese Art of Decluttering and Organizing. 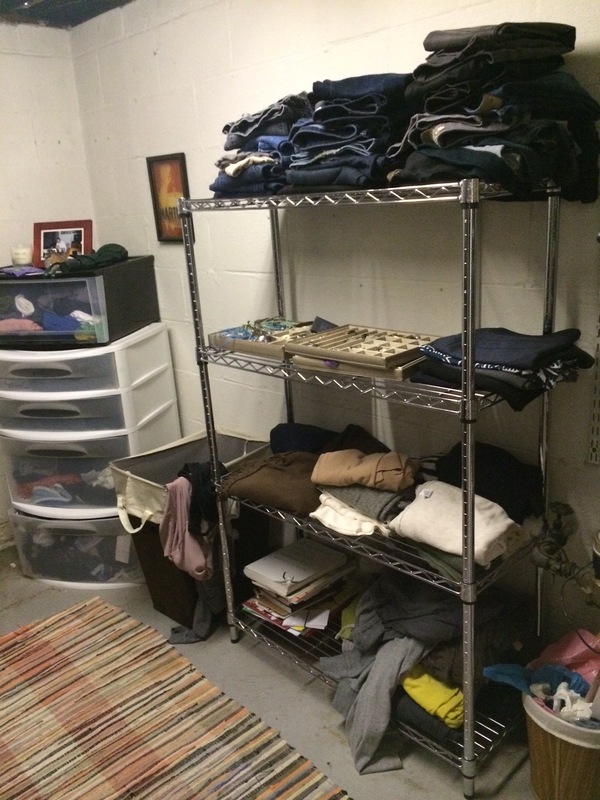 Whereas Jay advocates distance from our “stuff” and a recognition of its value as mere objects to meet a purpose, Kondo seems to revere objects as joy- giving accumulations with their own spiritual nature while advocating for the same outcome: declutter your stuff, have less, live in gratitude. Jamey and I have used elements of each of these writers/philosophers on minimalism to reorganize our lives/homes. Personally, he was more a fan of the Jay’s philosophy and methods, and while I am the doer and less of the studier of minimalism, I tend to agree. At the same time, I struggle at times to value possessions less. Sure, we have less space for stuff than most people, but I also really like my stuff. There are numerous reasons I do not enjoy posting this (these) pictures. One, it shows something I hate about myself- my at times rampant consumption of clothing and accessory products. Two, I live in Grandview, Ohio where closets this large don’t exist. 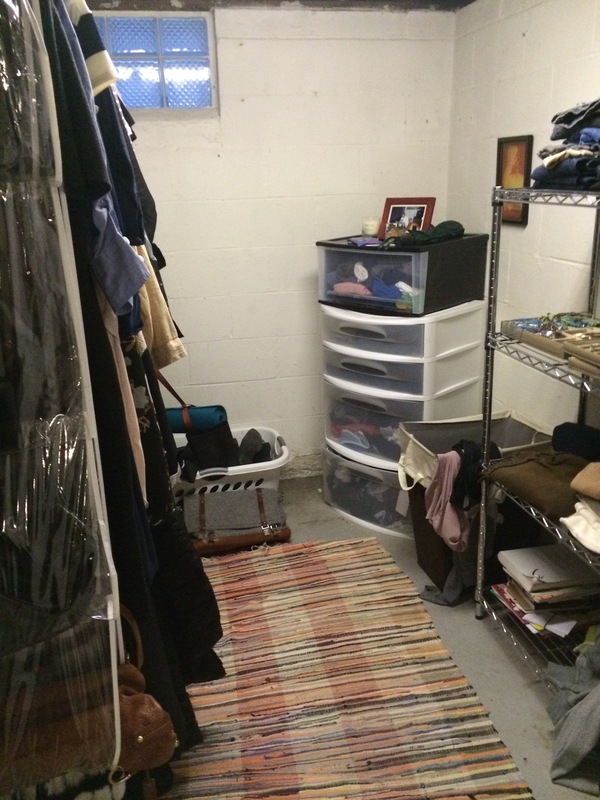 Jamey turned a cinder block storage room into a closet for me because in our old place, he had to deal with my clothes problem exploring all over our bedroom. Not conducive to his essentialist and efficiency-oriented personality. Please note, to the right, my extensive scarf collection based upon many years of gathering, across continents even. It was a joke in my old workplace how often I wore scarves… I was like, known, for wearing scarves (by teachers and students). While I tend to understand my occasional shopping binges as poor impulse control and a subtle form of addiction more than a lack of self worth specifically, I do connect with the idea that it is easier to get rid than it is to stop consuming. Jamey follows the “one in, one out” rule far better than I do. While I know that we are probably careful consumers in most areas, this really only makes the situation more difficult and consuming (pardon my pun): as modern Americans, most of us are addicted to stuff and it is a cultural issue as well as an individual issue. This makes it so hard to escape the system because we are raised in it. I am no exception. I like the way a new pair of shoes makes me feel, but when I buy them, more often than not, they really just make me think about how now I need the perfect __________ (fill in the blank) to go with them. It is a never ending cycle, like any addiction, and it is so prevalent in our society that it is rarely even noticed as a problematic behavior. Yes, we talk about having too much stuff, but to really step out of consumer culture totally? That is rarely ever the question. How do you cope with living in a consumerist-based society? Is it important to you to have less stuff? To value stuff less? How do you go about this? What do possessions mean to you? The feature photo in this post is one of my favorite places in my house: a bench seat window in our kitchen. It is a snuggly, wonderful little nook for reading, writing and napping. 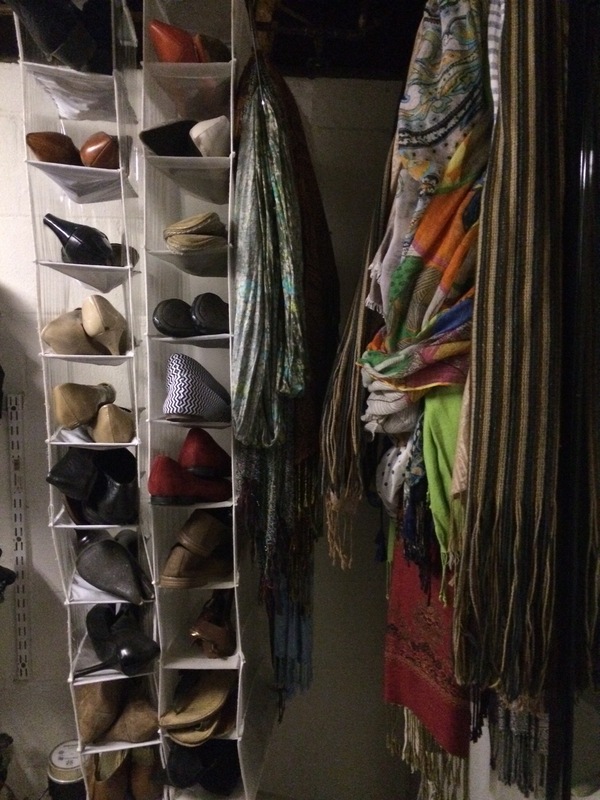 I dedicate this post to my wonderfully organized and minimalist husband who has, over the years, taught me much about managing my stuff (and my adult life). My blog is misbehaving and formatting keeps changing on me. So sorry about the strangeness of the spacing on this! Please feel free to participate in the conversation via comments here on the blog! I would love to hear from others. Love this post. My life is easier when I own less stuff. The more stuff I own, the more time I spend maintaining stuff rather than enjoying reading, time with friends, being outdoors, etc. I will never want a large home because I would hate to spend as much time as my parents did mowing the lawn, making updates and doing maintenance, etc. … though they loved spending their free time on upkeep, I don’t. Shopping is harder – you are right about the challenge being not to replace all the purged things with more things, and discerning where the impulse comes from. Right now as I change my life internally, I want my external surroundings to change, too, and I enjoy replacing old with new to reflect my internal life and vice versa – changing surroundings to change internal life. Thanks for a thoughtful reflection! Brandi, Wonderfully written article. You mean there’s a simpler solution than just putting up another storage shed? Ha! I am proud of you for keeping the minimalism as a goal and way of life. As women, we so often think of our “stuff” as treasures that evoke warm memories, and then the painful struggle emerges if forced to part with these. Carry on! Great writing and loved the photos. That kitchen nook is definitely a coveted spot.